"These are a crowd pleaser. 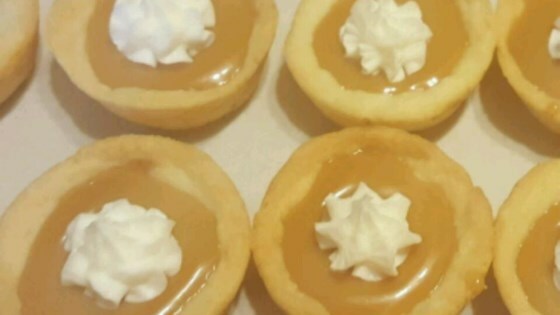 They have a flaky crust wih a creamy caramel filling." Combine the cream cheese, butter or margarine and flour. Mix to form a dough. Pinch off 48 equal pieces and press into mini tassie pans. Bake at 350 degrees F (175 degrees C) for 15 minutes or until lightly brown. Cool slightly. Be careful taking out of pans, they break easily. In the microwave on medium high heat. Melt the caramels and 1/2 cup evaporated milk. Stir until creamy. Pour into melted caramel into shells and top with frosting. To Make Frosting: Beat the sugar, 1/3 cup evaporated milk, shortening and vanilla until light and creamy. I have one word to describe these...AWESOME. They are easy to make and delicious to eat. Just be careful taking them out of the pans because they are very fragile. These were wonderful! They were gone before all the other cookies we made. ADDICTING, albeit a pain to make. I've been asked to make for a wedding.